When people talk about Fraser Island’s sands, they usually refer to the 75 mile stunning stretch of sand on the world-renowned Fraser Island beach. This attraction has been ranked the 6th best spot on the island by visitors on the travel community site TripAdvisor because of the superb sights it offers. Nevertheless, there’s still more to Fraser’s sand than what’s found on its beaches. Some of the most mystifying yet striking sand can be found elsewhere – at The Pinnacles Coloured Sands. Discover what this natural wonder features in this article. Located 18 km south of Indian Head and a couple of kilometres north of the Maheno Shipwreck, The Pinnacles Coloured Sands is proof that Fraser’s pristine white sand isn’t the only thing that would captivate you. 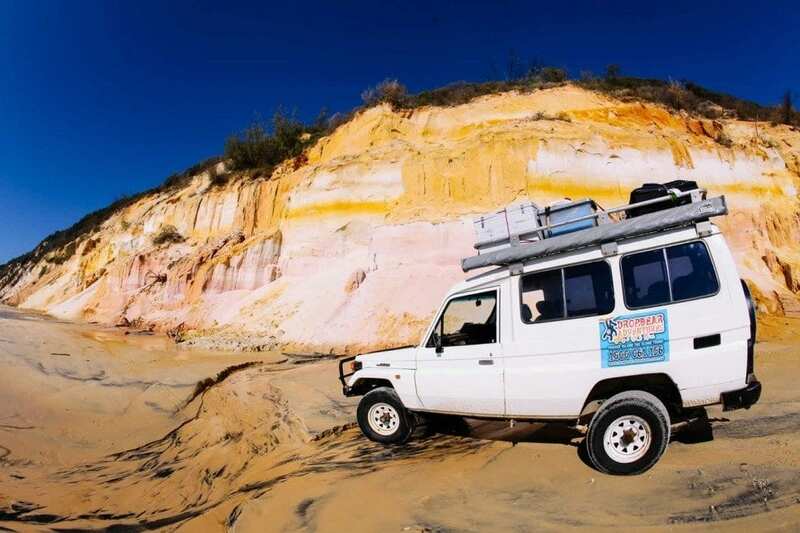 Its spectacular array of multi-coloured sand cliffs is simply one of the most amazing things on Fraser Island that your eyes could marvel at. The sand comes in rich and beautiful varieties of yellow, brown and orange cliffs shaped and sculpted thousands of years ago by nature’s most powerful elements: wind and water. Tale of the Butchulla women – The Pinnacles are considered sacred grounds for the Butchulla women, the native inhabitants of the island. According to TourFraser.com.au, the story of the site’s creation tells of a young woman named Wuru who was promised to marry an older man, Winyer, but fell in love with Wiberigan, the Rainbow serpent. Wuru went to visit the beach each day to be with Wiberigan, but one day Winyer followed her and saw her on the beach with Wiberigan. “In a jealous rage, he threw his boomerang at Wuru but Wiberigan protected her and took the blow. The Rainbow Serpent shattered into thousands of pieces which fell to earth colouring the cliffs,” says The Eternal Traveller. Wuru escaped and was unharmed, and from then on, The Pinnacles Coloured sands became a place of good luck for the Butchulla women. Scientific theories – The most accepted scientific wisdom as to the formation of the coloured sands is the immersion and conglomeration of sand with clay. According to Queensland’s Department of National Parks, Recreation, Sport and Racing, the cliff’s “yellow, brown and red colours were created as iron-rich minerals stained the sand a complex array of tones and hues over thousands of years. Spectacular sculptures emerge where wind and rain erode the sandmass, exposing this soft older core.” Other examples of coloured sands can be found at Rainbow Gorge, The Cathedrals, and Red Canyon. When you visit Fraser Island, make sure you have enough film and digital space in your camera as you’ll be snapping photos everywhere you go. And anyone who wields a camera, be it a pro or an amateur, must know that The Pinnacles definitely deserves more than just one shot. Nobody could have ever said it more perfectly than Mark Moxon of LongDistanceWalks.com, “Imagine a combination of Purnululu and Nambung, and you’re not far off the rainbow-coloured spires of the Pinnacles; add in a blue sky peppered with surreal cloud formations, and it’s a postcard photographer’s delight.” Be sure to come in the morning so you can take advantage of the morning light to get the best shots of The Pinnacles. It doesn’t matter whether you’re among the natives or not—a trip to The Pinnacles will surely make you feel “lucky” to be able to behold the sight! Join us at Dropbear Adventures today for a memorable trip to the beautiful sand cliffs of The Pinnacles. We promise, you’ll be happy you did! Why go to Fraser Island from Rainbow Beach?